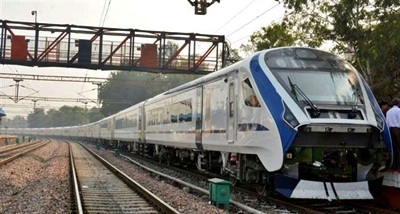 India's first locomotive-less train, known as Train 18, has breached the 180 kilometres per hour speed limit during a test run at Kota-Sawai Madhopur section in Rajasthan. When this indigenously designed train is made operational, it will become the country's fastest train. "Train 18 is capable of touching 200 kilometres per hour provided the rest of Indian Railways' system, such as tracks and signals, permit. With 16 coaches, the train will have the same passenger carrying capacity as that of the Shatabdi Express. It has aerodynamically designed driver cabins at both ends for quicker turn-around at destinations. The train also sports an advanced regenerative braking system which saves power. The fully air-conditioned train offers better passenger comfort and safety, as all equipment are fixed under the carriage so that more space is available on board. S Mani, General Manager of Integral Coach Factory that has manufactured the train expressed the hope that 'Train 18' will commence its commercial run from next month."